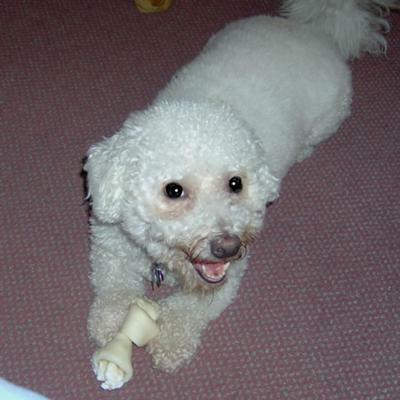 Mickeyfinn came to us in 2007 from the SPCA with the unlikely given name of "Bichon Johnson". Maybe a spoof on a big football player's name. Not sure, but he's a little white fuzz-ball of a dog so ... maybe they thought it would make him more appealing to the GUY types... who knows? Well, no matter, Mickey is his name and he keeps us laughing and loving it. He, however, shows no inclination for football or for that matter any ball at all! He does love stuffed doggie toys of any kind and the ones that squeak or quack all the better. And he really loves rawhide toys too. Mickeyfinn is our FUREVER pal!